Lewis & Maese Auction: "Treasures from Asia, Africa and Europe"
"Treasures from Asia, Africa and Europe" comprise nearly 300 lots on the block. The African artifacts collection features 19 pieces from tribes across the continent. 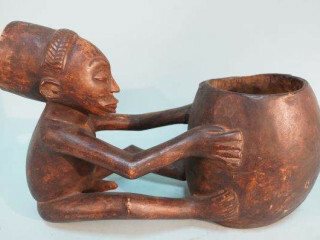 Examples include a Luba Tribal Chief's Seat from Congo, ($1,000-1,500); a bowl-bearer from the Luba Tribe ($450-850), which was placed at the door of tribes women who had recently given birth; an intricately beaded royal stool and retainer from the Bamum Tribe of Cameroon ($950-1,850); and a secret ritual figurine of a hornbill carved by the Senufo Tribe of the Ivory Coast ($2,200-3,200). Other interesting items include a Roman-style torchiere floor lamp, a mid-century chrome chandelier and a variety of sculptures and paintings. An online preview catalog is available at lmauction.com.